BEIJING, China (CNN) -- A group of British children and teachers quarantined for nearly a week in China because of swine flu fears were allowed to leave their hotel Tuesday, Britain's Foreign Office said. 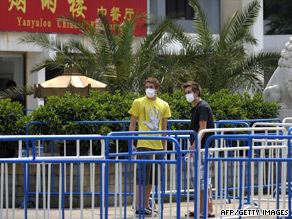 Two students outside the Yan Xiang Hotel where a group of British children and teachers have been quarantined. A spokesman could not confirm the number of children and teachers released from quarantine, but they were among a group of 111 that was sequestered in a Beijing hotel six days ago. The students and teachers came from various schools in Britain and were all traveling to China together as members of the same British school association, the Specialist Schools and Academies Trust. Twelve children were hospitalized and diagnosed with the H1N1 virus, commonly known as swine flu. One child is in the hospital awaiting test results to confirm the virus, the Foreign Office said. The group released from quarantine Tuesday will now be moved to a different hotel, the Foreign Office said. The second group is due to be released from quarantine Wednesday, the Foreign Office said. Olivia Bishop, one of the teachers on the trip, said Chinese authorities pulled three students aside as soon as they landed at the airport because they had high temperatures. Two tested positive for mild symptoms of the virus, she said, and the rest of the group was able to continue with planned sightseeing. "When we got back to the campus that evening, we were about to have our dinner and we were told to go back to a classroom and wait, and then we were taken to the hotel to be quarantined," Bishop told Sky News. CNN's Ashleigh Nghiem in London, England, contributed to this report.